Please tick to confirm that a copy of the credit unions privacy notice has been made available to you. Thursday April 18th OPEN 9.30 a.m. to 5.00 p.m.
Saturday April 20th OPEN 9.30 a.m. to 2.30 p.m.
Thursday April 18th OPEN 9.30 a.m. to 6.00 p.m.
Wednesday April 17th OPEN 1.30 p.m. to 5.00 p.m.
Thursday April 18th OPEN 9.30 a.m. – 5.00 p.m.
Congratulations to Alice Ryan of Bansha, Tipperary our March winner of our Members Car Draw, Alice won a brand new Renault Clio! Tipperary Credit Union has a very proactive Youth Committee that runs various youth initiatives throughout the year. One such initiative is the Transition Year Bursary Awards, which is now in its fifth year. We at Tipperary Credit Union are aware of the benefits of a student completing the Transition Year programme. Designed to help students develop not just on an educational level but also on a personal, social, and vocational level it has a very positive effect on the student. The cost of putting a child through Transition Year can range from €500 to €1,000 depending on the school. As a result of this very costly expense the Transition Year Bursary was created. 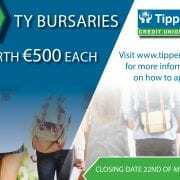 Tipperary Credit Union offers five €500 bursaries, one to each of the five secondary schools in our common bond. The Transition Year Bursary is an open draw and requires students to fill out and complete an application form and return it to our Head Office (Emmet Street, Tipperary Town, Co. Tipperary). Castletroy College (Castletroy, Limerick), Scoil na Trionoide Naofa (Doon, Limerick), St Anne’s Secondary School (Tipperary Town), St Ailbe’s Secondary School (Tipperary Town) and The Abbey CBS (Tipperary Town). Bursary application forms will be sent to all participating schools. If you attend any of the five schools but have not received an application, forms can be collected in our Head Office in Emmet St, Tipperary Town or downloaded from the link below. Students must be participating in next year’s Transition Year programme starting in September 2019 to be eligible to enter. 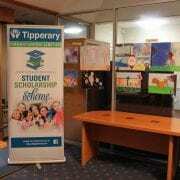 Students must return completed applications to Tipperary Credit Union, Emmet Street, Tipperary Town, Co. Tipperary. Closing date for entries is the 22nd of March 2019. Winning applicants are selected based on their application form and response to the question: What would it mean to you to win the Bursary? The winning student if not already a member of Tipperary Credit Union will need to open an account with Tipperary Credit Union prior to receiving the bursary. Please note we are open business as usual Saturday 16th of March from 9.30a.m. to 2.30p.m. in our Tipperary Town and Bansha offices. 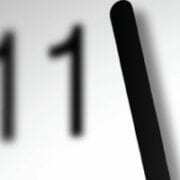 All branch offices are closed on Monday 18th of March. 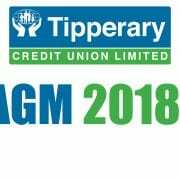 will take place in Ballykisteen Hotel and Golf Resort, Tipperary,on Tuesday the 11th December 2018 at 8 p.m.
Free member draws will take place for members present at the AGM. 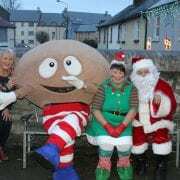 Merry Christmas to all our members. At Tipperary Credit Union we understand the importance of teaching our younger members the life skill of saving. As part of our Youth Programme we have set up several competitions designed to highlight to our younger members the advantages of saving a little bit on a regular basis. 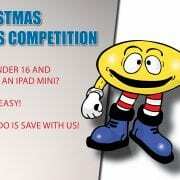 For our Christmas competition we have an iPad Mini up for grabs. Every time our young member saves they will receive an entry form into our draw for the iPad Mini. It is important that our younger members learn that getting into the habit of saving on a regular basis is very beneficial. To enter the member must be under the age of 16. Every time an eligible member makes a lodgement to their Tipperary Credit Union account they will receive an entry form. (Please ask a member of staff for an entry form if you did not receive one when a lodgement was carried out). The entry form must be completed and returned to your local branch office. The draw will take place live on Tipp Mid West Radio on our Christmas Members Day on Thursday the 20th of December. The competition runs from the 15th of November until the 18th of December. The Young Saver must be a member of Tipperary Credit Union. The Young Saver must be under the age of 16. By entering the draw consent is given for the Young Saver’s name to be announced live on air. 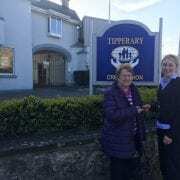 By entering the draw consent is given for a photo to be taken of the Young Saver which will be used for marketing purposes on Social Media, Websites, Print Media and Tipperary Credit Union marketing material. On Thursday the 18th of October we celebrated International Credit Union Day. Credit Unions across the world came together to celebrate the Credit Union movement and what it is has achieved. This year celebrated the 70th anniversary worldwide and the 60th anniversary here in Ireland. Tipperary Credit Union joins more than 68,800 credit unions around the world to celebrate the 70th annual International Credit Union Day(ICU Day) on October 18th next. In addition to being an important anniversary for the global movement, credit unions here are also celebrating 60 successful years of service in Ireland. To mark this significant milestones in Irish credit union history, this year’s ICU Day celebrations will focus on the unique financial services offered by credit unions. 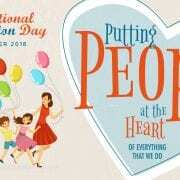 The celebrations will revolve around the theme of the credit union difference”, putting people at the heart of everything we do, which has endured for the past six decades in Ireland. All credit unions remain not-for-profit institutions that operate independently. All credit union decisions on services, products and the future direction of the organisation are made at local level, and in the best interest of the local membership. Credit unions remain a trusted and reliable provider of affordable credit in the communities they serve. In short credit union members always come first, above all else. •	When: 9pm sharp on Thursday the 18th of October. 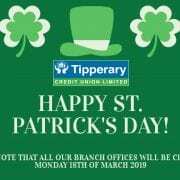 Mass will also be celebrated for past and present members of Tipperary Credit Union on Sunday October 14th at 12.30p.m. in St Michael’s Church, Tipperary Town. All members are invited to attend.